When a unique and upscale appearance is what you are hoping to achieve with your flooring selection, our 5” walnut natural hardwood in La Costa 92009 is a fantastic example. When walnut is being milled for flooring, two parts of the tree are involved. Heartwood is the part of the tree that is darker in color, and the sapwood portion of the tree is lighter, with creamy tan to almost white overtones. Because walnut is a hard wood that is more durable than many other flooring materials, it remains a popular choice. 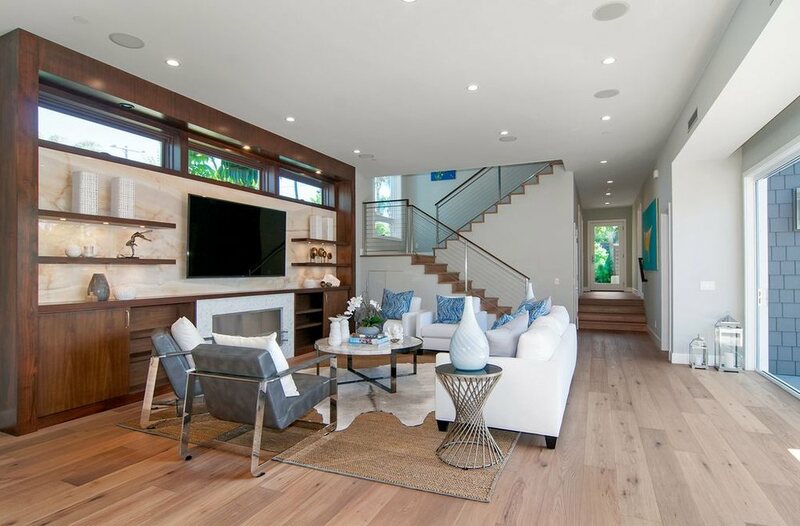 If you decide to install similar flooring as the 5” walnut natural hardwood in La Costa 92009 that you see above, you will be pleased to know that after the initial treatment, walnut flooring requires very little upkeep. Its smooth handscrapped surface makes cleaning quite simple, and a dust mop will usually do the trick. Dust and hair can be easily swept away with a moist mop as needed. Walnut flooring, as well as other wood surfaces is also a great flooring choice if there is a family member who suffers from allergies. On this particular project, we were asked to replace a woven bamboo floor covering that was installed by another company and was not acceptable to our client. We replaced their bamboo with 5” walnut natural hardwood by first carefully removing the old flooring. From there we applied our concrete sealer and Zero VOC quality adhesive. Once the floor was sealed, we laid down the gorgeous 5” walnut planks and trimmed them to fit. Now the home looks magnificent with flooring that not only is durable and long-lasting, it looks amazing and also will certainly enhance the value of this La Costa home.